"A fascinating premise and plenty of action." A cyber-dystopian future America is the scene of musician Curtis’s heartrending but uneven first novel. The lead-up to Isaak’s 18th birthday has involved a killer headache and dreams of other kids being chased by agents in black. 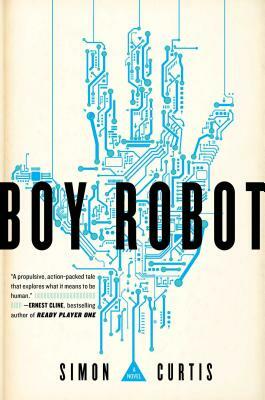 After a wound heals itself far too quickly to be natural and Isaak’s adoptive mother kicks him out of the house, he finds out that he is a “Robot”; government-made synthetic humans created for war and released into the population as babies by a scientist with a shady agenda, Isaak’s kind are being hunted and are forming an underground resistance. From there, Curtis’s adventure story of teens on the run becomes a tad predictable, but Isaak’s narration and a possible romance with a human male companion keep things interesting. Flashbacks of the other characters’ lives before joining the underground include graphic descriptions of transphobic and homophobic trauma, as well as sexual assault, to a point that sometimes feels gratuitous but also gives real insight into each teen’s situation, and certainly aims for empathy. A tension-filled ending leaves readers hanging on for a sequel. Ages 14–up.